See Where the Road Leads: Weekend Activities Back "Home"
Our plan had always been to return to Estes Park for the weekend of June 21 to attend the wedding of Kathy and Gary, two of Tim’s former colleagues at Rocky Mountain National Park. We arrived the day before and camped at Boyd Lake State Park, where we had stayed so many times in the past. 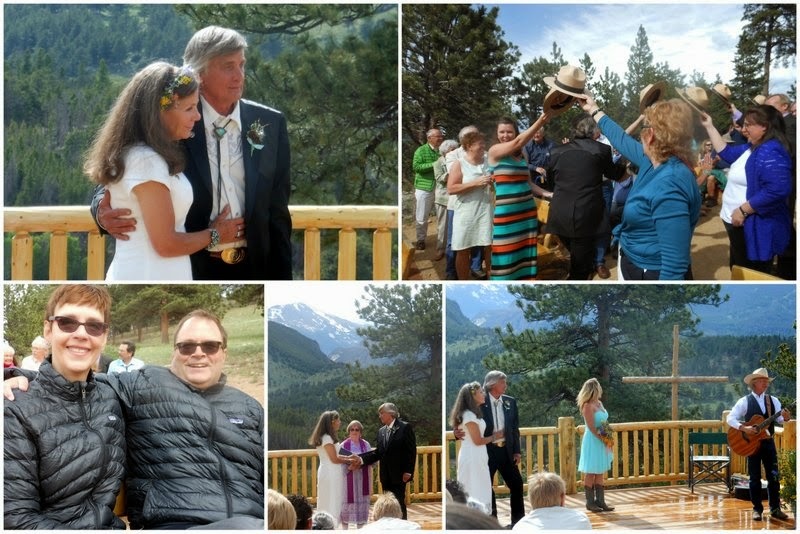 We drove to Estes Park on Saturday on a beautiful, sunny day and made our way to the YMCA of the Rockies where the wedding ceremony was to be held. As we climbed higher and higher to the appointed site, the temperature dropped and rain threatened. We were early and waited in the car for the afternoon storm to pass through. What didn’t pass, right away however, was the frigid temperature. Tim and I donned our down jackets on this first day of summer and walked over to the ceremony site. What a dramatic mountain backdrop for a wedding. Kathy was stunning in her white lace dress and turquoise cowgirl boots, and Gary was handsome in his western formal wear. The ceremony was very personal, and I don’t think there was a dry eye in the audience. My favorite part of the ceremony, however, was at the end. National park employees had been asked to bring their flat hats, which they raised to form an arch over the center aisle as the wedding party started the recessional. If you have ever watched a military wedding with its arch of swords, you can imagine how this might have looked. The newly married couple could not have had a more fitting sendoff. Since we had a week to “kill” until Tim’s high school reunion the following weekend, we had made reservations at Golden Gate State Park near Nederland, Colorado. We didn’t get to enjoy much of the park, however, because it was during this stay that Tim realized that he would have to do something about the pain he was experiencing in his neck and shoulders. Of course, there was no internet or cell phone service at Golden Gate Canyon, so we spent much of Monday and Tuesday driving back and forth to Nederland. There, he was able to make contact with his former surgeon and wait to hear if he could get an appointment for an MRI. On Tuesday afternoon, he learned that she had arranged for an appointment the next morning. Wow! That was quick! We quickly returned to Golden Gate Canyon, packed up and left to return to Boyd Lake State Park, which was close to the hospital where the MRI was to be done. It was a shame that we had to forego the remainder of our reservation at Golden Gate Canyon, but getting in for an MRI was more important. As you may remember from the post of July 6, which you can read here, Tim had his MRI on Wednesday and met with the neurosurgeon that same afternoon. The verdict – surgery was really the only option to correct the problem. 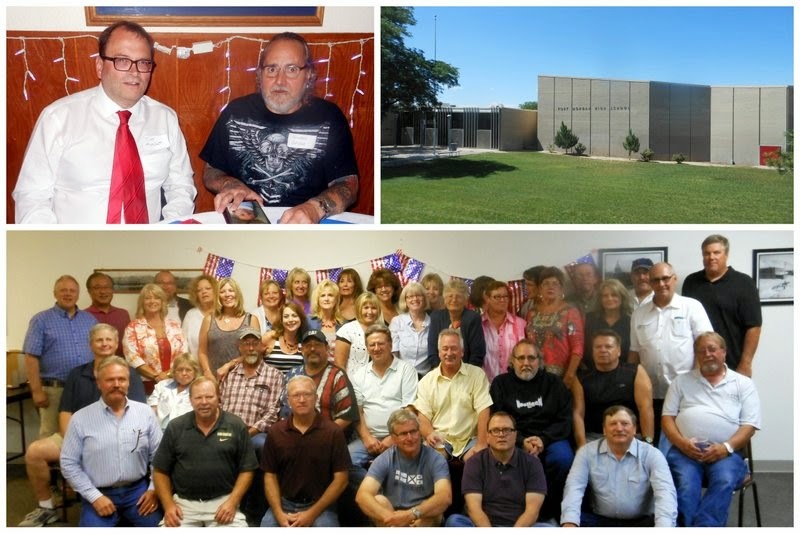 Surgery was scheduled for the following Tuesday, July 1, and we left Loveland on Friday with a supply of pain pills, to attend Tim’s high school reunion in Fort Morgan, Colorado. We made it to Fort Morgan for the picnic on Friday night, and it was there that I met most of his high school class. I enjoyed talking to Tim’s classmates, and everyone made me feel very welcome. The reunion committee had scheduled a tour of the high school on Saturday afternoon, and it was fun seeing Tim walk down memory lane. The highlight of the weekend was the dinner on Saturday night. We sat at the table with Tim’s best friend from high school, and I was able to spend more time with his wife as well. Howard and Pam are such great people. I especially loved hearing about Tim and Howard’s exploits in high school and tried to figure out who was the instigator. I’m sure we’ll be visiting Howard and Pam when we return to Washington State, hopefully next year. We had lunch with most of Tim’s siblings and their extended families on Sunday afternoon and left to return to Loveland where Tim would await surgery. It would be the start of a very long, hot summer in Colorado. In case you missed the posts, you can read about our summer here, here and here.